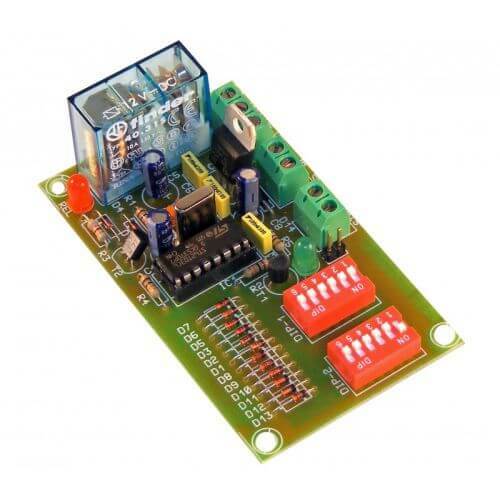 1 to 4 day precision delay timer module with a 5 Amp, 230Vac mains rated relay output. The delay time is set in 1 hour blocks using two banks of on-board DIP switches. Push-button or power-on activation. When activated the relay will operate until the time period has elapsed. 12Vdc powered. Timer is activated via the Start Input (using for example a push button or relay contact closure). On activation the relay turns on for the user-set delay time period. The timer will complete the preset timing period regardless of further trigger signals or if the contacts remain closed after activation. Once finished, a fresh trigger signal is needed to start a new timing period. An optional "Instant-On" mode disables the trigger input and commences the delay countdown immediately power is applied . The relay will stay on until the user-set time period has elapsed. The power must be removed and reapplied for a fresh countdown to commence. An LED indicates that the timer is in operation. The board is reverse polarity protected.